Every year thousands of people flock to Steamboat Springs to enjoy the leaves of the aspens turning brilliant shades of gold, orange and even red. If you are headed up to the mountains to view the fall colors there are a few things you should know. Stop by BAP, the little red house on Oak Street, for jackets, hats and gloves to keep you warm. Always take food and water. Even if you are going out for a couple of hours, you never know what can happen. Have enough food for a couple of meals. Let someone know where you are going and when you plan on being back. Take something to start a fire if you get stuck and need to stay warm. Take a map and a charged phone. Fish Creek Falls. If you hike up past the first waterfall for about a ½ hour to 45 minutes you’ll come to a beautiful aspen grove that literally glows gold in the fall. The hike is strenuous but well worth it. Little Bear Trail. This trail is located about a ¼ mile before you reach the Strawberry Park Hot Springs. The trail is also challenging, but offers wide open vistas of Strawberry Park and Steamboat as well as a changing landscape as you ascend. Buffalo Pass. 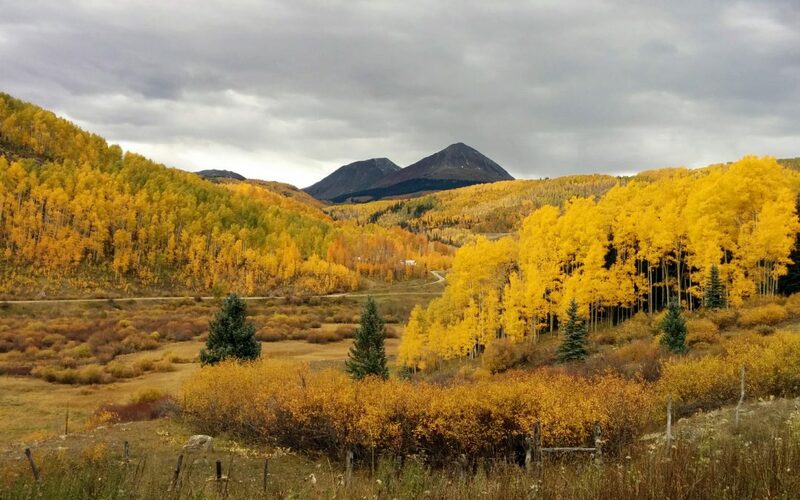 Driving up Buffalo Pass in the fall is an ascent into beauty. You’ll experience amazing views of the surrounding area, pine trees and aspens. There are many hikes you can take from Buffalo Pass so we recommend picking up the book ‘Hiking the Boat’ from Off the Beaten Path bookstore in downtown Steamboat. After you’ve finished your adventure for the day, especially if it’s been a strenuous one, here’s how we recommend you wind down. Spend a little time with the locals at Sunpie’s Bistro. Try the pork, gravy and French fry sandwich with a cold beer. Get a Swedish massage to relax your muscles at Life Essentials Day Spa. This spa was awarded Best of the Boat several years in a row. Soak in the Strawberry Park Hot Springs in one of Steamboat’s most scenic settings. Most of all enjoy your time in Steamboat this fall. It’s one of our top four favorite seasons.